Dubai: As UAE and Dubai Exiles star centre Jonathan Beeton lies in a coma in the city's Rashid Hospital this weekend following a boating accident, the local rugby community is rallying around in support of the young player's family who face an anxious wait by his bedside. Tests have revealed Beeton, 27, a key player for the UAE, has zero brain activity following the accident at a friend's birthday last Friday, but friends and family are refusing to give up and are willing the hugely popular South African to recover. Wife of just six months, Tammy Beeton, 23, told Gulf News yesterday: "The support from everyone has been amazing. All his rugby mates have visited him every morning and afternoon. "Everyone just loves him and has so much respect for him. In Dubai it's difficult because [at first] you don't have family around you, but his rugby colleagues more than made up for that." The site engineer, originally from Durban, suffered a broken neck and severe head injuries after falling from the top deck of a yacht and hitting his head on the motor below. Tammy, who first met Jonathan in 2003, said he was currently between tests after a CT scan found zero brain activity this week. Swelling to his spine and vertebrae had reduced and he was due to undergo further tests over the coming days, she added. "When we arrived at the hospital Jon was put into an induced coma. He's since been removed from the sedative and we're just waiting for him to wake-up," said best man at his wedding, Derrick Murray, 27, a fellow Dubai Exiles player. "As I understand the neck injury isn't as bad as first thought, we are just waiting on news from his head injury," he added. Having only just become eligible to play for the UAE following four years of residency, Beeton had exploded onto the national scene and featured in all six of the country's recent matches, including friendlies and the Asian Five Nations matches. He was described as a "stand-out performer" for the country during the Five Nations, where the UAE finished a surprise third in their debut season. "You wouldn't believe the support. The boys have all got together to help Jon's family get visas to come over here and be beside Jon and Tammy," said Murray. "The rugby community is massive here in the UAE and when the boys come together they are like brothers. No less than 20-30 of them have been visiting Jon in hospital at any one time. Tough times never last, but tough people do and Jonathan Beeton is as tough as they come," added Murray. Beeton's profile on the Dubai Exiles webpage has him down as a "Jack of all trades" who is a "strong and deceptively quick player who likes to be involved". Going by the nickname ‘Studente', Beeton started as a scrum-half, moving to wing and then centre. He was Exiles' player of the season for 2010/11. Fellow UAE and Exiles player Mike Riley said: "Jon is an exceptional player for Exiles and this news comes as a massive blow. But he's a fighter and a tough kid. "I've been on multiple tours with the lad and he's just a quality individual. We are all devastated." 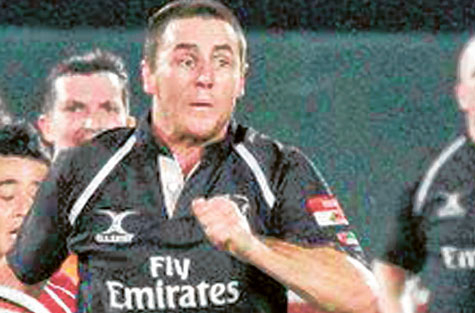 Officials at both Dubai Exiles and the UAE RA said their thoughts and prayers were with Beeton's family and friends. Dubai Exiles met last night to discuss how they could further assist the family. Mike Cox Hill, captain of both Exiles and the UAE, said: "We're awaiting future test results to determine what support and assistance is needed from the club." Meanwhile Beeton's Facebook page is awash with messages of support. One read: "Thinking of you Jonny, I know you have the strength to fight through anything! DGU — DON'T GIVE UP," from Bruce. Another message of support from Sally-Ann said: "Everyone is praying for you Jono! You have so much to live for: loving family, beautiful wife, and an amazing career! Come on your mates need you!" Hayley added: "So many people love you Jon and need you to come back to us! Please find the strength to wake-up."